Home Soccer Castro: "Caparrós is an option for next year"
Castro: "Caparrós is an option for next year"
Sevilla makes a wreath to San Benito. "We needed a revulsive, the twelve of fifteen says it all," says the president. 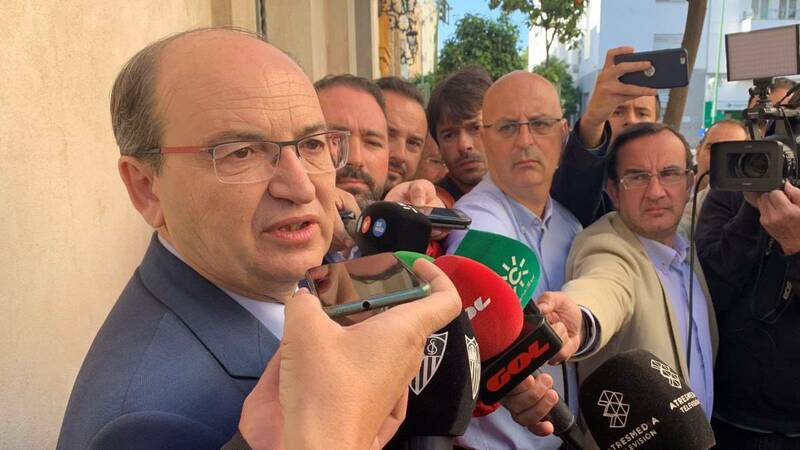 José Castro, president of Sevilla, attended the media after the floral offering his club made to the Brotherhood of San Benito on the morning of today. The president was clear when valuing the future of Joaquín Caparrós in the bench facing the next season: "It is time to continue adding points and to continue transmitting that joy of play in the team. It is transmitting good things and we have to wait. Now the important thing is the team. I do not discover anything if the own Monchi, that gives us tranquility and that is number one in his, says that Joaquín has evolved a lot and is getting results. Clear that Joaquin is an option. Not only for what he achieves but for what he transmits ". Castro, which took the decision to replace Pablo Machín several weeks ago and give the post to Caparrós, makes clear his vision:" The points tell us and what transmits the team, the game, since Caparrós took the template. Twelve of fifteen says it all. We made the change at the time we understood adequate, we needed a revulsive and faith that is right. But sometimes it hits and sometimes, the opposite. " The president stressed that the team has strength and quality at the same time he sent an message of tranquility on the health of Caparrós:" I want to send a message of tranquility. It is a routine analytic and we really hope it does not go any further. The doctors are calm about it. It has no treatment. He is the same as always and enjoying his club. "